The funeral service for Gertrude “Gert” Holzerland, 90, of Stewartville,MN will be at 11:00 A.M. on Tuesday (March 26, 2019) at St. Johns Lutheran Church in Stewartville with Rev. Lyle Fritsch officiating. Burial will follow at Woodlawn Cemetery in Stewartville. 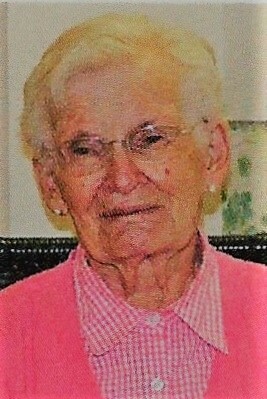 Mrs. Holzerland died on Friday (March 22, 2019) of natural causes at the Stewartville Care Center where she had resided since 2017. Gertrude Mary Whetson was born on November 14, 1928 in Morton,MN to William and Mary(O’Connor) Whetson. She grew up in Morton, attended school there, graduating from Morton H.S. in 1946. Gertrude was married on October 28, 1947 in Morton,MN to Royce K. Holzerland. Following their marriage the couple moved to a farm in rural Stewartville where they raised their family, farmed for many years and lived for over 65 years, before moving to Rochester in 2011. Gert was a homemaker and farmwife and was known to be an expert seamstress who could sew anything from bridesmaid dresses to simple alterations. Royce was a lifelong farmer and was a sales representative for Pioneer Seeds for many years. Mr. Holzerland died on June 27, 2014. Gert then moved to Root River Estates in Stewartville. She was a longtime member of St. Johns Lutheran Church and was active in it’s Ladies Aid activities. The Holzerlands enjoyed traveling including trips overseas and across the U.S. in a motorhome and also liked square dancing. Gert kept a large garden and canned. She enjoyed baking and cooking, knitting and crocheting, liked to collect bird figurines and followed the MN Twins, Vikings and H.S. basketball. She was known for her ready smile and many in her extended family looked to her for motherly advice. She enjoyed time spent with friends and family, especially her grandchildren and great-grandchildren. Gert is survived by her son – Larry(Marilyn) of Mound,MN and daughter – Janet Holzerland of Rochester; 3 grandchildren – Andrew(Ali) Holzerland, Bradley(Megan) Holzerland and Charles(Kelly) Holzerland; 4 great-grandchildren – Grayson, Owen, Grant and Scarlet: a brother - Francis “Mike” Whetson of Lake Lillian,MN and many nieces and nephews. She was preceded in death by her husband - Royce and son – Greg, her parents and 2 sisters – Charlotte “Chuck” Christenson, Margaret “Marmie” Latcham, and 3 brothers – Bernard “Bud” Whetson, Vince Whetson and James Whetson. A time of visitation will be held 1 hr. prior to the service at the church on Tuesday morning. Arrangements are with Griffin-Gray F.H. in Stewartville. Condolences and memories of Mrs. Holzerland are welcome at www.griffin-gray.com.